As the above chart shows, the ADP did a pretty good job of tracking the BLS estimates of job growth up until about a year ago. The January ADP estimate of private sector job gains failed once again to come even close to the figure compiled by the Bureau of Labor Statistics. Plus, the BLS estimate came in much weaker than expectations (+50K vs. +145K). Despite these disappointments, however, this wasn't a bad jobs report. A good deal of the variance can be attributed to very bad weather in January and to the quirks of seasonal adjustments and benchmark revisions to the population estimate. Calculated Risk has a nice discussion of this here. With improving weather we are likely to see much bigger job gains in the months ahead. As this next chart shows, even with all the problems that depressed job gains in January, the two key measures of jobs are both reporting the same rate of growth over the past year: about 1.25% annualized. That's sluggish, but it should be picking up over the course of this year, and over time that should be enough to reduce the unemployment rate. It was also nice to see an outsized gain of 49K manufacturing jobs, the biggest monthly gain in 10 years, confirming the strength that has been showing up in the ISM manufacturing surveys. 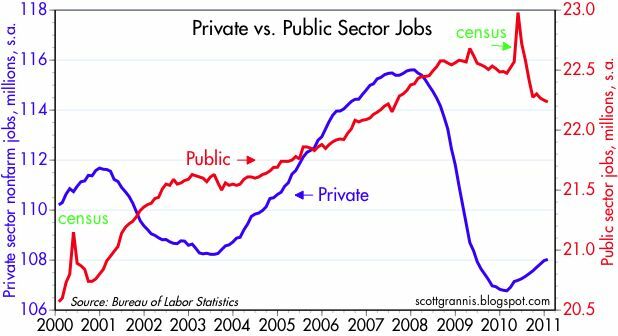 As the chart above shows, the public sector continues to shed jobs, which is actually good news since it means that state and local governments are tackling their budget problems by cutting costs. The public sector has suffered from excessive bloat for years now, and a cutback was long overdue. Expect this trend to continue. Finally, the best part of the report was a big and unexpected drop in the unemployment rate. It's still high, but it should be working its way lower over the course of the year. If it is slow to decline, at least part of the reason will be that with an improving economy, the number of people wanting to work will probably increase, and that will add to the number that are considered to be unemployed. There will be the inevitable corrections. And there are always the unexpected events that can cause panic and downdrafts. But, the way things have been going, it sure looks like waiting for the dip is the new wrong! why tsint your reputation with such pollyana posts? you make assertions you cannot possible know or even be reasonably certain are true. This report was ugly, no two ways about it. 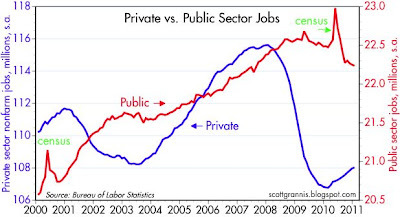 Despite the US borrowing about $300 billion/mo between Federal and local governments, we only managed to create 36,000 jobs ? The labor force participation rate (again) declined. 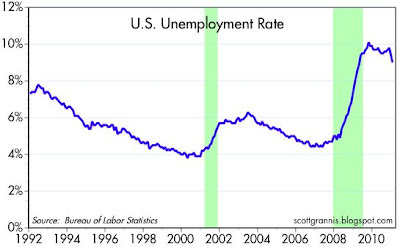 The unemployment rate went down.. because so many people have simply given up looking. Sorry, but the only recovery we'll see is already happening.. on Wall Street. 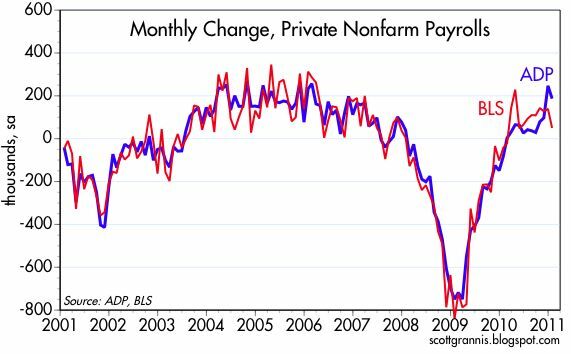 Employment/Unemployment is a lagging indicator. Besides, months later, figures like these always are revised. 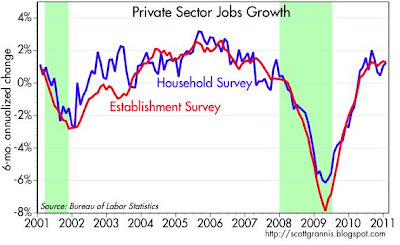 Is it true that the number of jobs added in 2010 was revised down by about 500,000? If so, that's pretty bad. Scott: Thanks for sharing your experience and wisdom on Seeking Alpha. I first started reading your postings around March, 2009. I vividly remember your call on the economy back then. I wish I had started to read your postings much earlier. Congratulations on having the patients to deal with all the worthless comments you sometimes receive. There are those of us "out there" who really value your contribution. 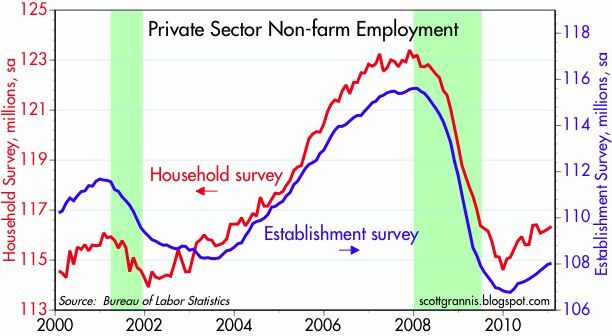 Correction: according to Zero Hedge, the number of jobs added was revised down 500,000 from 2009-2010. The downward revision to jobs was the result of a change in the population estimate. This is one of the reason that you can't take the jobs number very seriously--it is subject to huge revisions over the years. But the downard revision affected several years of data, shifting the whole series downward. The number of new jobs created since the recession, and the rate at which they were created, did not change very much at all, however. 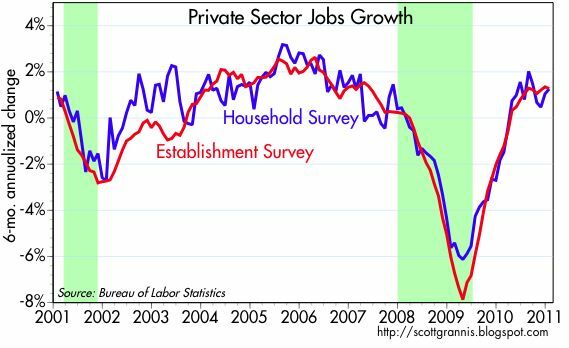 Employment is NOT a lagging indicator, it is a coincident indicator. The talking heads frequently get that wrong. Underemployment is the better number to watch than unemployment, and it stands near record levels (19%). We still have a scary amount of our collective productive capabilities collecting dust, and a "recovery" benefiting far too few people. As Sir Grannis has pointed out, these government reports are constantly and continually revised. If the past price of individual stocks or indices were revised months and years after the fact, would you trust or put that much credence in the figures? Horrible report, Ben B creating more debt to reward banker greed will make this movie ending a "once in a lifetime event"
Ben B could care less about the unemployed...the whole qe canard is to float the banks, the same ones who shorted the market to its favor..the same regulators..